Bonsai from the National Bonsai & Penjing Museum at the United States National Arboretum. Bonsai (盆栽, "tray planting" pronunciation (help·info)) is a Japanese art form using trees grown in containers. Similar practices exist in other cultures, including the Chinese tradition of penjing from which the art originated, and the miniature living landscapes of Vietnamese hòn non bộ. The term "bonsai" itself is a Japanese pronunciation of the earlier Chinese term penzai. The word bonsai is often used in English as an umbrella term for all miniature trees in containers or pots. This article focuses on the history of bonsai in Japan and, in modern times, worldwide. The Japanese art of bonsai originated from the Chinese practice of penjing. From the 6th century onwards, Imperial embassy personnel and Buddhist students from Japan visited and returned from mainland China, bringing back souvenirs including container plantings. At least 17 diplomatic missions were sent from Japan to the Tang court between the years 603 and 839. Japan's historical Shōsōin, which houses 7th, 8th, and 9th-century artifacts including material from Japan's Tenpyō period, contains an elaborate miniature tree display dating from this time. This artifact is composed of a shallow wooden tray serving as a base, carved wooden mountain models, and sand portraying a riverine sandbar. The artifact includes small tree sculptures in silver metal, which are meant to be placed in the sand to produce a table-top depiction of a treed landscape. Though this display is closer to the Japanese bonkei display than to a living bonsai, it does reflect the period's interest in miniature landscapes. The c. 1300 rhymed prose essay, Bonseki no Fu (Tribute to Bonseki) written by celebrated priest and master of Chinese poetry, Kokan Shiren (1278–1346), outlined the aesthetic principles for what would be termed bonsai, bonseki and garden architecture itself. At first, the Japanese used miniaturized trees grown in containers to decorate their homes and gardens. Criticism of the interest in curiously twisted specimens of potted plants shows up in one chapter of the 243-chapter compilation Tsurezuregusa (c. 1331). This work would become a sacred teaching handed down from master to student, through a limited chain of poets (some famous), until it was at last widely published in the early 17th century. Before then, the criticism had only a modest influence on dwarf potted tree cultures. In 1351, dwarf trees displayed on short poles were portrayed in the Boki Ekotoba scroll. Several other scrolls and paintings also included depictions of these kinds of trees. Potted landscape arrangements made during the next hundred years or so included figurines after the Chinese fashion in order to add scale and theme. These miniatures would eventually be considered garnishes decidedly to be excluded by Japanese artists who were simplifying their creations in the spirit of Zen Buddhism. Around the 14th century, the term for dwarf potted trees was "the bowl's tree" (鉢の木 hachi no ki). This denoted the use of a fairly deep pot, as opposed to the shallow pot denoted by the term bonsai. Hachi no Ki (The Potted Trees) is also the title of a Noh play by Zeami Motokiyo (1363–1444), based on a story from c. 1383. It tells of an impoverished samurai who sacrifices his three last dwarf potted trees as firewood to provide warmth for a traveling monk on a winter night. The monk is an official in disguise who later rewards the samurai by giving him three lands whose names include the names of the three types of trees the samurai burnt: ume (plum), matsu (pine), and sakura (cherry). In later centuries, woodblock prints by several artists would depict this popular drama. There was even a fabric design of the same name. Stories referring to bonsai began to appear more frequently by the 17th century. Shōgun Tokugawa Iemitsu (r. 1623–1651) was a hachi no ki enthusiast. A story tells of Okubo Hikozemon (1560–1639), councilor to the shōgun, who threw one of Iemitsu's favorite trees away in the garden—in sight of the shōgun—in order to dissuade him from spending so much time and attention on these trees. In spite of the servant's efforts, Iemitsu never gave up his beloved art form. Another story from this time tells of a samurai's gardener who killed himself when his master insulted a hachi no ki of which the artisan was especially proud. Bonsai dating to the 17th century have survived to the present. One of the oldest-known living bonsai trees, considered one of the National Treasures of Japan, is in the Tokyo Imperial Palace collection. A five-needle pine (Pinus pentaphylla var. negishi) known as Sandai-Shogun-No Matsu is documented as having been cared for by Tokugawa Iemitsu. The tree is thought to be at least 500 years old and was first trained as a bonsai by, at latest, the year 1610. The earliest known report by a Westerner of a Japanese dwarf potted tree was made in 1692 by George Meister. Chinese bonsai containers exported to Japan during the 17th and 18th centuries would become referred to as kowatari (古渡 "old crossing"). These were made between 1465 and about 1800. Many came from Yixing in Jiangsu province—unglazed and usually purplish-brown—and some others from around Canton, in particular, during the Ming dynasty. Miniature potted trees were called hachi-ue in a 1681 horticulture book. This book also stated that everyone at the time grew azaleas, even if the poorest people had to use an abalone shell as a container. Torii Kiyoharu's use of woodblock printing in Japan depicted the dwarf potted trees from horticultural expert Itō Ihei's nursery. In Itami, Hyōgo (near Osaka), a group of scholars of Chinese arts gathered in the early 19th century to discuss recent styles in the art of miniature trees. 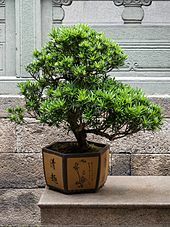 Their version of these, which had been previously called "hachiue" or other terms, were renamed "bonsai" (the Japanese pronunciation of the Chinese term penzai). This term had the connotation of a shallower container in which the Japanese could now more successfully style small trees. The term "bonsai", however, would not become regularly used in describing their dwarf potted trees for nearly a century. Many others terms and compositions adopted by this group were derived from Kai-shi-en Gaden, the Japanese version of Jieziyuan Huazhuan (Manual of the Mustard Seed Garden). In 1829, a significant book that first established classical bonsai art, Sōmoku Kin'yō-shū (草木錦葉集, A Colorful Collection of Trees and Plants/Collection of tree leaves), was published. It includes the basic criteria for the ideal form of the classical pine bonsai, in detail and with illustrations. That same year, small tako-tsuki (octopus-styled) trees with long, wavy-branches began to be offered by a grower in Asakusa Park, a north-eastern Edo suburb. Within 20 years that neighborhood became crowded with nurseries selling bonsai. The three-volume Kinsei-Jufu, possibly the first book of bonsai, tools, and pots, dates from 1833. Numerous artists of the 19th century depicted dwarf potted trees in woodblock prints, including Yoshishige (who pictured each of the fifty-three classic stations of the Tōkaidō as miniature landscape) and Kunisada (who included mostly hachi-no-ki in some four dozen prints). The earliest known photograph from Japan depicting a dwarf potted tree dates from c. 1861 by Pierre Rossier. Pots exported from China between 1816 and 1911 (especially the late 19th century) were called nakawatari or chūwatari (both meaning "middle-crossing"), shallow rectangular or oval stoneware with carved feet and drainage holes. Unglazed pots of this type were used at ancestral shrines and treasured by the Chinese. After the mid-century, certain Japanese antiquities dealers imported them and instant popular approval for this type of container for bonsai created a huge demand. As a consequence, orders came from Japan to Yixing pottery centers specifically to make bonsai pots. An Artistic Bonsai Concours was held in Tokyo in 1892 followed by the publication of a three-volume commemorative picture book. This demonstrated a new tendency to see bonsai as an independent art form. In 1903, the Tokyo association Jurakukai held showings of bonsai and ikebana at two Japanese-style restaurants. Three years later, Bonsai Gaho (1906 to c. 1913), became the first monthly magazine on the subject. It was followed by Toyo Engei and Hana in 1907, and Bonsai in 1921. Count Ōkuma (1838–1922) maintained a famed collection of dwarf pines and dwarf plum trees. By 1914, "at the N.E. corner of Shiba Park is a permanent bazaar (the first of its kind established in Tokyo) where hosts of native-made gimcracks can be bought at fixed prices. The exhibits of potted plants and dwarf trees held here from time to time attract lovers of such things." In the same year, the first national annual bonsai show was held (an event repeated annually through 1933) in Tokyo's Hibiya Park. During this period, the tokonoma in formal rooms and tea rooms became the main place for bonsai display. The shaped trees now shared space with other items such as scrolls, incense burners, Buddhist statues and tea ceremony implements. The 1923 Great Kantō earthquake and resulting fire devastated Tokyo, and gutted the downtown area where many bonsai specimens were grown. And so, two years later, a group of thirty families of downtown Tokyo professional growers established the Ōmiya Bonsai Village, northeast of the capital. The first great annual public exhibition of trees was held at the Asahi Newspaper Hall in Tokyo in 1927. The first of the very prestigious Kokufu-ten exhibitions were held in Tokyo's Ueno Park, beginning in 1934. By the following year, tokonoma display principles allowed for bonsai to be shown for the tree's individual beauty, not just for its spiritual or symbolic significance. The caretaker of the Imperial bonsai collection, Kyūzō Murata (1902–1991), was one of very few persons allowed to take care of bonsai during the Pacific War. He gathered together and preserved many trees from the other Omiya growers and would water them under the protection of night. Throughout 1945, many old trees were the smallest casualties of the spring and summer napalm bombing of Tokyo (especially March 9/10) and sixty-six other cities. Gardeners protected the Imperial collection trees from fire by pouring water over them after the Palace caught fire when neighboring areas were bombed on May 25/26. Following the surrender of Japan, there began the post-war re-evaluation and reviving of damaged collections of trees—including the Imperial—which would continue for over a decade as Japan was rebuilt. Many of the Omiya growers did not continue their vocation. Following World War II, a number of trends made the Japanese tradition of bonsai increasingly accessible to Western and world audiences. One key trend was the increase in the number, scope, and prominence of bonsai exhibitions. For example, the Kokufu-ten bonsai displays reappeared in 1947 after a four-year cancellation and became annual affairs. These displays continue to this day, and are by invitation only for eight days in February. In October 1964, a great exhibition was held in Hibya Park by the private Kokufu Bonsai Association, reorganized into the Nippon Bonsai Association, to mark the Tokyo Olympics. A commemorative album titled Gems of Bonsai and Suiseki was published in Japanese and English. Other countries began presenting bonsai exhibitions as well, with recurring events now taking place in Taiwan and a number of other Asian countries, Australia, the United States, several European countries, and others. Currently, Japan continues to host regular exhibitions with the world's largest numbers of bonsai specimens and the highest recognized specimen quality. Another key trend was the increase in books on bonsai and related arts, now being published for the first time in English and other languages for audiences outside Japan. In 1952, Yuji Yoshimura, son of a leader in the Japanese bonsai community, collaborated with German diplomat and author Alfred Koehn to give bonsai demonstrations. The first formal bonsai courses opened to the public and outsiders in Tokyo. Koehn had been an enthusiast before the war, and his 1937 book Japanese Tray Landscapes had been published in English in Peking. Yoshimura's 1957 book The Art of Bonsai, written in English with his student Giovanna M. Halford, addressed both cultivation and aesthetic aspects of bonsai growing and went on to be called the "classic Japanese bonsai bible for westerners" with over thirty printings. The related art of saikei was introduced to English-speaking audiences in 1963 in Kawamoto and Kurihara's Bonsai-Saikei. This book described tray landscapes made with younger plant material than was traditionally used in bonsai, providing an alternative to the use of large, older plants, few of which had escaped war damage. Other works in Japanese and English had been published by this time, and afterward a tremendous number of books saw print. Translations and original volumes in over two dozen languages were published over the following decades. Once Japanese was no longer the sole language of bonsai, the number of clubs outside of Asia increased and interaction increased between members of all levels of experience. By the beginning of the 1970s, these trends were beginning to merge. A large display of bonsai and suiseki was held as part of Expo '70, and formal discussion was made of an international association of enthusiasts. Three monthly magazines were started this year: Bonsai Sekai, Satsuki Kenkyu, and Shizen to Bonsai. In 1975, the first Gafu-ten (Elegant-Style Exhibit) of shohin bonsai (13–25 cm (5–10 in) tall) was held. So was the first Sakufu-ten (Creative Bonsai Exhibit), the only event in which professional bonsai growers exhibit traditional trees under their own names rather than under the name of the owner. It was organized by Hideo Kato (1918–2001) at Daimaru Department Store in Tokyo. The First World Bonsai Convention was held in Osaka during the World Bonsai and Suiseki Exhibition in 1980. Nine years later, the first World Bonsai Convention was held in Omiya and the World Bonsai Friendship Federation (WBFF) was inaugurated. These conventions attracted several hundreds of participants from dozens of countries and have since been held every four years at different locations around the globe: 1993, Orlando, Florida; 1997, Seoul, Korea; 2001, Munich, Germany; 2005, Washington, D.C.; 2009, San Juan, Puerto Rico; 2013, Jitan, Jiangsu, China; 2017, Saitama, Saitama, Japan. Bonsai has now reached a world-wide audience. There are over thirteen hundred books on bonsai and the related arts in at least twenty-six languages available in over ninety countries and territories. A few dozen magazines in over thirteen languages are in print. Several score of club newsletters are available on-line, and there are at least that many discussion forums and blogs. Educational videos and just the appearance of dwarf potted trees in films and on television reach a wide audience. There are at least a hundred thousand enthusiasts in some fifteen hundred clubs and associations worldwide, as well as over five million unassociated hobbyists. Plant material from every location is being trained into bonsai and displayed at local, regional, national, and international conventions and exhibitions for enthusiasts and the general public. ^ Taylor, Patrick (2008). The Oxford companion to the garden (2nd ed.). Oxford: Oxford University Press. p. 53. ISBN 978-0-19-955197-2. ^ Keswick, Maggie; Oberlander, Judy; Wai, Joe (1990). In a Chinese garden. Vancouver: Dr. Sun Yat-Sen Garden Society of Vancouver. p. 59. ISBN 978-0-9694573-0-5. ^ a b Yoshimura, Yuji (1991). "Modern Bonsai, Development Of The Art Of Bonsai From An Historical Perspective, Part 2". International Bonsai (4): 37. ^ a b Kobayashi, Konio (2011). Bonsai. Tokyo: PIE International Inc. p. 15. ISBN 978-4-7562-4094-1. ^ Nippon Bonsai Association (1989). Classic Bonsai of Japan. Kodansha International. p. 140. ^ "Dwarf Potted Trees in Paintings, Scrolls and Woodblock Prints, to 1600". Magical Miniature Landscapes. Retrieved 2010-04-07. ^ Yi, O-nyoung (1984) . Smaller Is Better, Japan's Mastery of the Miniature ( Chijimi shikoo no Nihonjin ) (First English ed.). Kodansha International, Ltd. p. 89. ^ Del Tredici, Peter (1989). "Early American Bonsai: The Larz Anderson Collection of the Arnold Arboretum". Arnoldia (Summer). ^ "Tokugawa Iemitsu's Pine". Magical Miniature Landscapes. Retrieved 2016-08-10. ^ "George Meister's dwarf tree observations". Magical Miniature Landscapes. Retrieved 2016-08-10. ^ Naka. Bonsai Techniques II. pp. 304–305, 322. ^ Katayama, Tei'ichi (1974). The Mini Bonsai Hobby. Japan Publications, Inc. pp. 19–20. ^ Koreshoff, Deborah R. (1984). Bonsai: Its Art, Science, History and Philosophy. Timber Press, Inc. p. 8. ISBN 0-88192-389-3. ^ "Dwarf Potted Trees in Paintings, Scrolls and Woodblock Prints, 1600 to 1800". Magical Miniature Landscapes. Retrieved 2016-08-10. ^ "Bonsai Books 1800 to 1840". Phoenix Bonsai. Retrieved 2010-04-19. ^ Nozaki, Shinobu (1940). Dwarf Trees ( Bonsai ). Sanseido Company, Ltd. pp. 25–26. ^ O'Connell, Jean (1970). "The Art of Bonsai". Science Digest (March): 38. ^ "Bonsai Books 1800 to 1840". Magical Miniature Landscapes. Retrieved 2010-04-07. ^ "Dwarf Potted Trees in Paintings, Scrolls and Woodblock Prints, 1800 to 1868". Magical Miniature Landscapes. Retrieved 2010-04-07. ^ "Earliest Known Photograph from Japan that includes a Dwarf Potted Tree by Pierre Rossier, c.1861". Magical Miniature Landscapes. Retrieved 2016-09-01. ^ a b Yamada, Tomio (2005). "Fundamentals of Wiring Bonsai". International Bonsai (4): 10–11. ^ a b Hill, Warren (2000). "Reflections on Japan". NBF Bulletin. XI: 5. ^ Koreshoff. Bonsai: Its Art, Science, History and Philosophy. p. 8. ^ Nozaki. Dwarf Trees ( Bonsai ). p. 43. ^ Donovan, Earl H. (1978). "The Spirit of Bunjin". ABS Bonsai Journal. 12 (2): 30. ^ Naka. Bonsai Techniques II. pp. 306, 322. ^ Katayama. The Mini Bonsai Hobby. p. 20. ^ "Expositions Known to Have Had Bonsai Present". Magical Miniature Landscapes. Retrieved 2016-09-01. ^ "Bonsai Book of Days for February". Magical Miniature Landscapes. Retrieved 2016-09-01. ^ "Dwarf Trees from Current Literature". Magical Miniature Landscapes. Retrieved 2016-09-13. ^ Collins, Percy (1907). "The Dwarf-Tree Culture of Japan". Windsor Magazine (October): 540. ^ ""Count Okuma's Dwarf Trees" from Francis E. Clark in The Independent". Magical Miniature Landscapes. Retrieved 2016-09-13. ^ Naka. Bonsai Techniques II. p. 322. ^ Katayama, Tei'ichi (1974). The Mini Bonsai Hobby. Japan Publications, Inc. p. 20. ^ Koreshoff. Bonsai: Its Art, Science, History and Philosophy. p. 242. ^ Collins, Percy (1969). "The Dwarf-Tree Culture of Japan". ABS Bonsai Journal (1): 17. ^ "Bonsai Book of Days for September". Magical Miniature Landscapes. Retrieved 2016-09-13. ^ Koreshoff. Bonsai: Its Art, Science, History and Philosophy. pp. 242–243. ^ a b "The Imperial Bonsai Collection, Part 1". Magical Miniature Landscapes. Retrieved 2016-09-13. ^ Nippon Bonsai Association. Classic Bonsai of Japan. p. 154. ^ "Kyuzo Murata, the Father of Modern Bonsai in Japan, Part 1". Magical Miniature Landscapes. Retrieved 2016-09-13. ^ "Some of the Serious Conditions in Japan After World War II". Magical Miniature Landscapes. Retrieved 2016-09-13. ^ "The Conventions, Symposia, Demos, Workshops, & Exhibitions, Part VI". Magical Miniature Landscapes. Retrieved 2016-09-13. ^ "The Books on Bonsai and Related Arts". Magical Miniature Landscapes. Retrieved 2016-09-13. ^ Elias, Thomas S. (2002). "The Best Bonsai and Suiseki Exhibits in Japan". Bonsai Magazine. 41 (May/June): 12. ^ "The Conventions". Magical Miniature Landscapes. Retrieved 2017-04-27. ^ "About Bonsai Pots and Potters". Magical Miniature Landscapes. Retrieved 2016-09-13. ^ "To Boldly Grow: Some Celluloid Bonsai (An Overview)". Magical Miniature Landscapes. Retrieved 2016-09-13. This page was last edited on 17 November 2018, at 03:23 (UTC).